As I write this post I'm listening to Pecadora by Marissa Mur on repeat (if you want to mix it up your music little, the Café con Leche playslist from Spotify has been my jam lately) and finalizing details for our week away. We're heading to upstate New York for a little over a week with a jam packed schedule, full of time spent with family and friends, wine tasting and boat rides. Nearly as soon as we get back, we're heading right back out again to celebrate Robert's 30th with friends at a cabin. I love July because it inevitably ends up being a boatload of travel for us (little bit of pun intended), and with most of our summer free time dedicated to house stuff, particularly Robert's, it'll be nice to take a break and unplug for a minute. A family reunion for Robert's mom is bringing us to the Cayuga Lake region this weekend, our fav! We're following that up with some wine tasting on Seneca + Cayuga with his folks and mine, and then we're all heading back to Rochester for some 4th of July festivities and general summertime hanging. Even though it's just the same old home sweet home, and this will be a relatively low-key vacation, Rochester in the summer is seriously *the best*. When we go back around this time every year, the thing we look forward to the absolute most is being on the water. We always go out on my parent's boat as much as we can the week of the 4th, and if the weather is in our favor we'll be able to head out more than once. I've learned from experience that a swimsuit and shorts doesn't always cut it. It can be super windy on the lake and Rochester weather is known to be all over the place at the drop of a hat, so I always have layers on hand in case of any such event. My summertime boat + beach look never strays too far from the classics. I love a good one piece, a baggy oversized button down, a hat, and a roomy sweater. When I saw that J. Crew was re-releasing some of their classic styles from the 80's and 90's, my heart actually skipped a beat. Their 1988 rollneck sweater is perfection, and as a lady in the tall with an extra long torso camp, they have been my go-to for swim in recent years. If you've ever seen the Tumblr JCrewing (or Drunk J. Crew my other fav) there are some GEMS from the 90s archived there. I inevitably scroll through just before the start of summer, peaking at old catalogs and craving days spent at the beach with my cell phone switched off. It must come as no surprise that I love packing. Unpacking on the other hand... I won't pretend I'm the person that gets home and neatly organizes everything immediately. I think my longest running record of how long a suitcase has remained packed is two weeks, but hey who's counting! Actually my husband is most certainly counting, I can promise you that. The vibe for this trip has a very subdued color palette that I'm totally okay with. I tend to have a theme when planning my outfits for a vacation, and it came as no surprise that earthy tones and soft fabrics are what I gravitated towards the most. 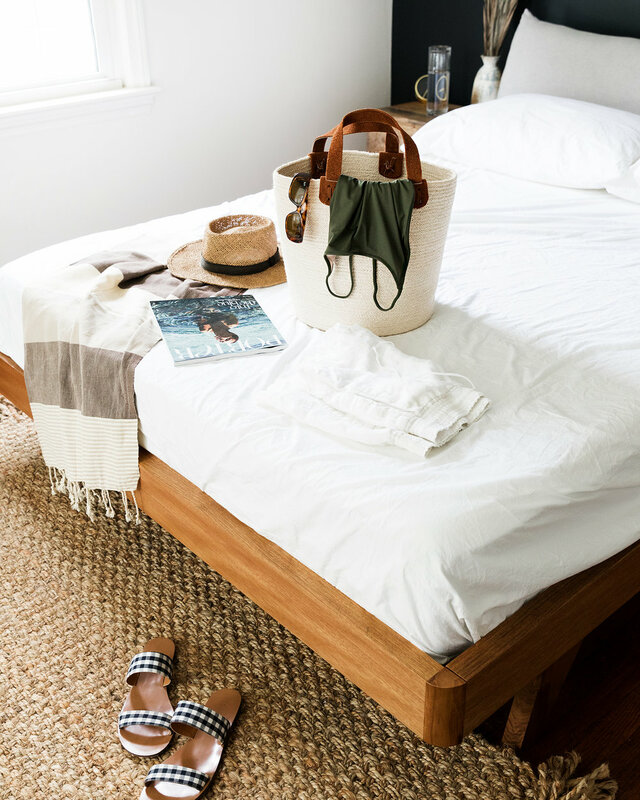 I rounded up a list of my summer favorites below, hoping they'll offer some inspiration as you pack for your next adventure, big or small. Cheers to packing for summer vacation, and to switching your phone off.